After a robust retreat in June, hay prices dropped only minimally in July, based on USDA’s most recent Agricultural Prices report released last week. The All Hay price dropped $1 per ton to $159, which is still $18 higher than July 2017. Other Hay (hay other than alfalfa) actually jumped $5 per ton from June to $126 per ton. That’s $6 higher than July 2017. 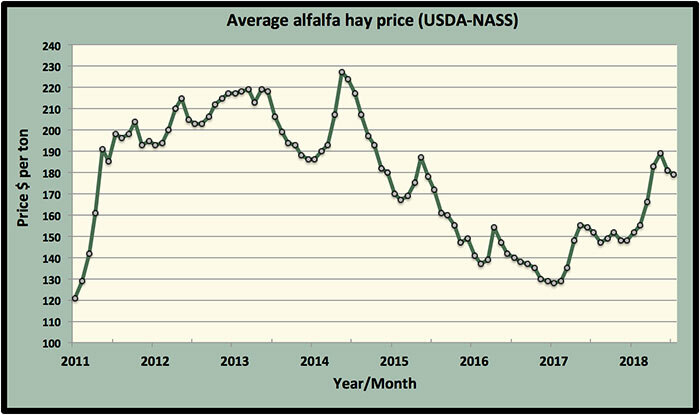 The average July Alfalfa Hay price dropped by $2 per ton from June to $179 per ton, which is $26 higher than one year ago, The Alfalfa Hay price is still $30 per ton above last December. As a general rule, annual alfalfa prices peak during April or May. The largest Alfalfa Hay price gainers in July were New York (up $27 per ton), Michigan (up $15), Pennsylvania (up $14), and Colorado (up $10). Significant price decliners included Nebraska (down $24 per ton), Texas (down $24). Wisconsin (down $21), North Dakota (down $17), Iowa (down $13), South Dakota (down $12), Oklahoma (down $11), and Washington (down $10). 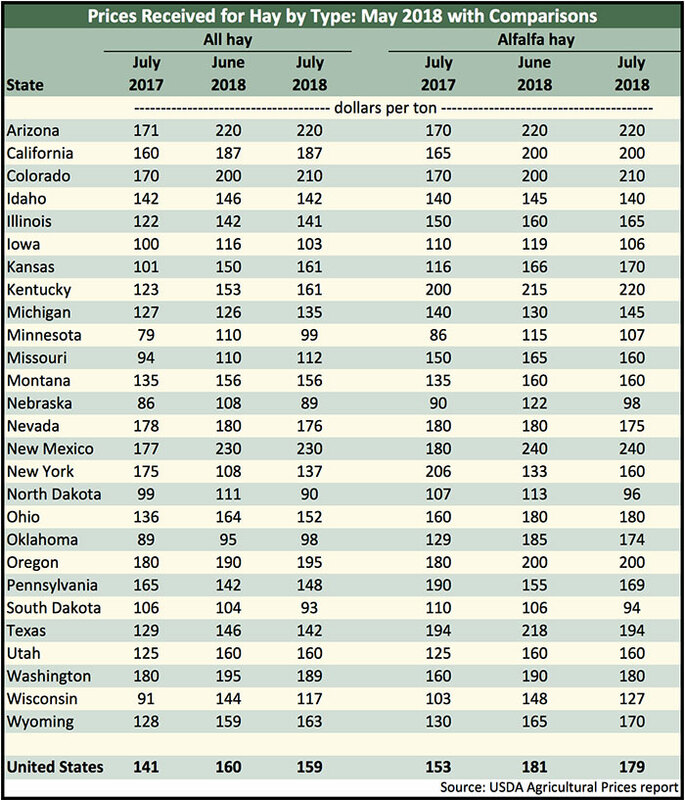 The highest average Alfalfa Hay prices were reported from New Mexico ($240 per ton), Kentucky ($220), Arizona ($220), Colorado ($210), California ($200), and Oregon ($200). The lowest prices were found in South Dakota ($94 per ton), North Dakota ($96), and Nebraska ($98).